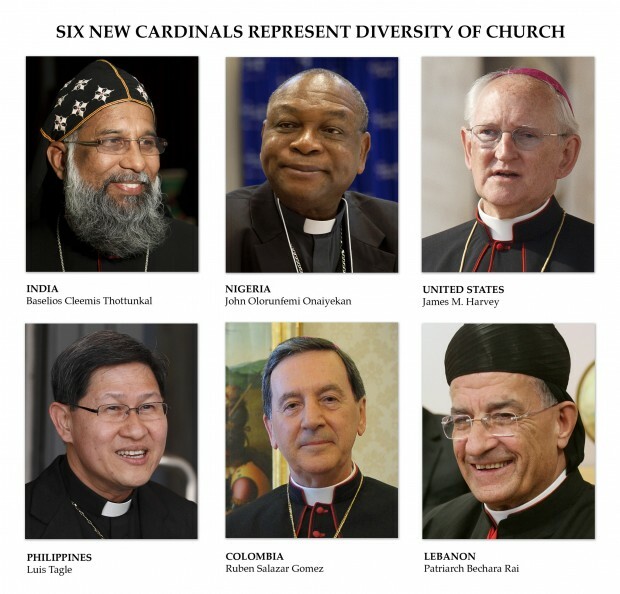 The six new “princes of the church” hail from six different countries in North America, Latin America, Africa and Asia, and represent both the Latin-rite of the Catholic Church as well as two of the Eastern Catholic Churches. Inducting them into the College of Cardinals Nov. 24, Pope Benedict will bring up to 120 the number of cardinal-electors — those under the age of 80 and eligible to vote in a conclave to elect a new pope. With the exception of the Catholic newspaper Avvenire, the headlines in Italian newspapers the morning after Pope Benedict announced the new cardinals all pointed out the absence of new Italian or new European cardinals. Painting the pope’s move as drastic and trying to make sense of it, Il Foglio and several other papers jumped to the conclusion that the pope deliberately excluded Italians because of the “VatiLeaks” scandal. The scandal saw the publication of private Vatican and papal correspondence, much of it painting a picture of careerism and corruption in the Vatican, mostly involving Italian curial officials and bishops. The new cardinals will make up only 5 percent of the electors in the College of Cardinals, but they shift the continental balance, even if just slightly. The percentage of European electors will drop from almost 55 percent Nov. 16 to just over 51 percent Nov. 24; the figure contrasts sharply with the fact that, according to Vatican statistics, less than 24 percent of the world’s Catholics live in Europe. The new consistory will bring the percentage of Asian electors from 7 percent to 9 percent. Catholics in Asia account for just over 10 percent of the worldwide Catholic population. Naming two prelates in their 50s to the college also will lower the average age of the cardinal-electors; as of Nov. 16 the electors’ average age was just over 72. The six new cardinals slated to receive their red hats and cardinal rings are: U.S. Archbishop James M. Harvey, 63, prefect of the papal household; Lebanon’s Maronite Patriarch Bechara Rai, 72; Indian Archbishop Baselios Cleemis Thottunkal, 53, head of the Syro-Malankara Catholic Church; Nigerian Archbishop John Olorunfemi Onaiyekan of Abuja, 68; Colombian Archbishop Ruben Salazar Gomez of Bogota, 70; and Philippine Archbishop Luis Tagle of Manila, 55. When Pope Benedict created 22 cardinals in February, 16 of them were Europeans. Obviously, the pope does not make his choice based on geography first of all. Most of the cardinals hold positions that by Vatican norms or by ancient tradition are held by cardinals. Given the large number of Italians heading Vatican offices and the numerous Italian archdioceses traditionally led by cardinals, the Italians would have a numerically powerful bloc of votes in a conclave to elect a new pope. In fact, after the consistory is over and the six new cardinals are welcomed into the group, the Italians still will have 28 voters, 20 of whom were created cardinals by Pope Benedict. With the exception of Europe, no single continent has the number of electors Italy has; Latin America comes closest with 21 electors. But sometimes those who should be cardinals are kept in an archbishop’s magenta for a while; the most obvious example of that is Archbishop Gerhard L. Muller, who was named prefect of the Congregation for the Doctrine of the Faith in July. Vatican norms — and the practical responsibilities of a job that involves doctrinal oversight of Vatican offices headed by cardinals — dictate that the prefect be a cardinal. He’ll just have to wait a bit. Of the 120 electors who will be part of the college Nov. 24, 40 of them work in or have retired from positions in the Roman Curia. The other 80 are archbishops who head dioceses or patriarchs and major archbishops who head Eastern churches. Cardinal-designate Rai, the Maronite patriarch, will bring to 21 the number of cardinal-electors who entered the priesthood and ministered as members of religious orders. The Salesians top the list with four cardinals — three of them, including Cardinal Tarcisio Bertone, Vatican secretary of state — work in the Roman Curia. The group of electors also includes three Franciscans and two Jesuits. A greater variety of nations, languages, spiritual and liturgical traditions in the College of Cardinals obviously means a more “catholic” group of participants in the cardinals’ most solemn responsibility: electing a new pope. But the variety also has a very real impact on the Roman Curia because each cardinal becomes a member of one or more Vatican congregations or councils, bringing his experience to bear on decisions that impact the universal church.